Oak Brook, Illinois – January 26, 2017 - Millennium Trust Company®, a leading provider of specialized custody solutions for institutions, advisors, and individuals, has rounded out the year 2016 with continued growth, bringing the total assets under custody to $20.8 Billion in 527,000 custodial accounts. 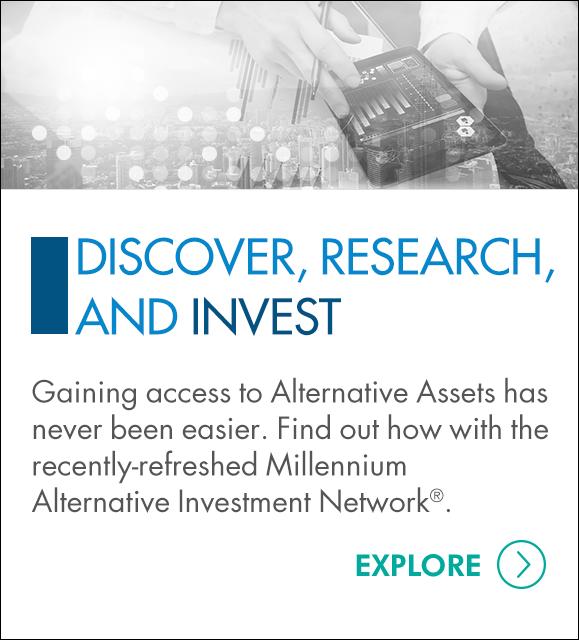 Among the firm’s many milestones in 2016, the Millennium Alternative Investment Network® (MAIN®) launched last January to provide advisors and high-net-worth investors an easier way to access alternative assets, ranging from private equity and hedge funds to crowdfunding and multi-strategy investments, and then purchase and custody those investments in their Millennium accounts. MAIN allows investors to complete the opening and funding process entirely online. “The growth exhibited by the Millennium Alternative Investment Network exceeded our expectations, beginning with the launch in January 2016, to attracting 15 participating platforms and finishing the year with a win at the 2016 WealthManagement.com Industry Awards, where our innovative technology was honored in a category recognizing custodians (emerging - less than $25 billion) for their technology advancements,” said CEO Gary Anetsberger. Anetsberger also had a transformative year, taking the helm as CEO of Millennium Trust in March of 2016. During the fourth quarter, two new platforms joined the Millennium Alternative Investment Network, bringing the total of participating companies to 15. We welcomed additional platforms EquityMultiple and LendingRobot to MAIN. EquityMultiple is a platform connecting accredited investors with shares of exclusive, pre-vetted commercial real estate deals. LendingRobot is an automated investment tool that allows retail investors to take part in peer-to-peer lending, and was the first SEC-registered Investment Advisor in the peer-to-peer lending industry. The year 2016 brought multiple executive moves at Millennium Trust Company including Gary Anetsberger’s promotion to CEO from Chief Operating Officer, Dan Laszlo's hire as Chief Financial Officer in March, and Tom Daley's appointment as Managing Director, Alternative Solutions Group in November, bringing 25 years of experience in the financial services industry to his new position. Product offerings also expanded this year, namely with the Rollover Solutions Group led by Terry Dunne, introducing a new online search tool to help individuals find unclaimed retirement funds held at Millennium Trust that they may have left behind when changing jobs. The Rollover Solutions Group finished the year on a high note, with more than 500,000 automatic rollover accounts on the books. Additionally, Millennium’s Fund Custody Group expanded its services to support funds leveraging their loan portfolios by providing verification and certification services required by the funds’ credit facilities. Millennium also expanded its services to include providing custody for ’40 Act Funds.